Calling all world travelers, history buffs and DIY enthusiasts! If you’ve been looking for a creative way to highlight your road trip memories or trace your family ancestry, today’s tutorial by embroidery enthusiast and Spoonflower maker Robert Mahar is the “X marks the spot” on your handcrafted adventure. 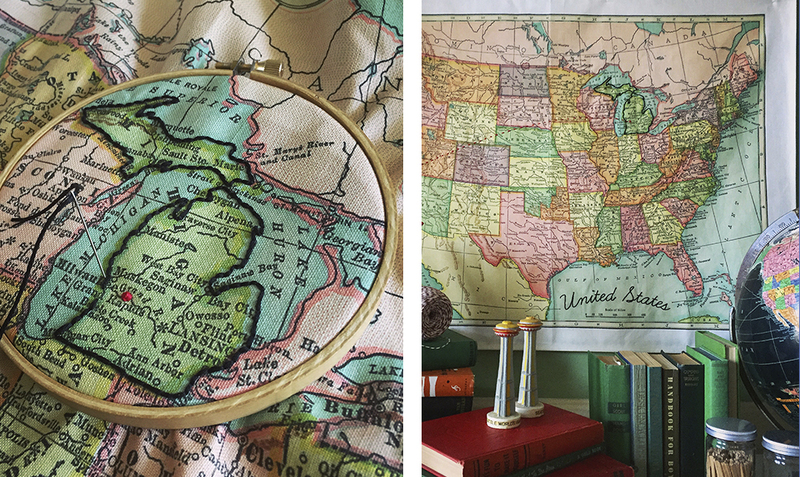 Once you’ve seen the five ways Robert personalizes a map with embroidery, keep your DIY journey going by reserving a spot at Craftcation, a four-day business + makers conference filled with DIY workshops including an embroidery class from Robert! Feeling the winter blues? The cold days of January can make anyone stir-crazy. Instead of staring at the same old furniture, cheer up your space with this easy weekend project using our go-to home déc material: woven wallpaper. Whether you use an old bookcase at home or pick one up from a tag sale, this refresh is guaranteed to help you see your reading nook in a new light! Follow along as Spoonflower’s president, Allison Sloan Polish, takes you through the DIY. Close your eyes and imagine a space where your favorite makers all get together in one place for you and your friends to shop. Lucky for you, and thanks to the Renegade Craft Fair, you don’t just have to imagine this magical place! 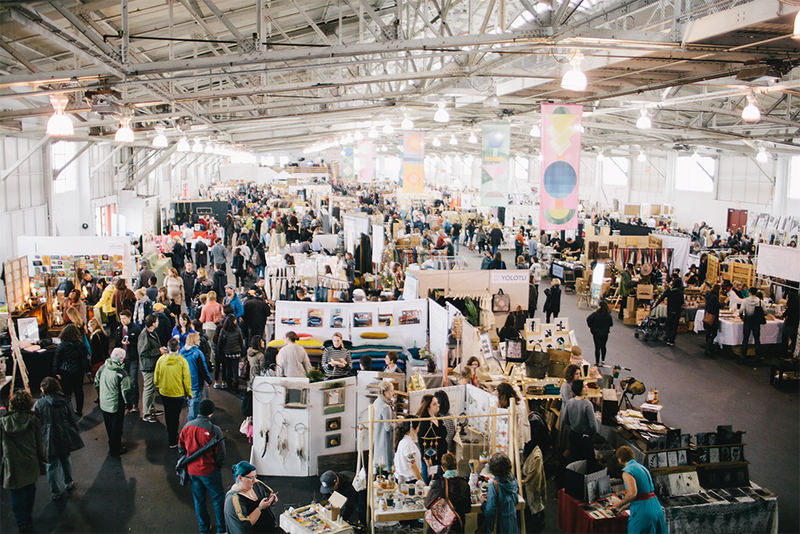 The Renegade Craft Fair is the world’s largest curated showcase of independent crafters and designers, now with fairs in 12 cities across the world. Today we’re so pleased to welcome Madelon Juliano, Associate Creative Director at Renegade Craft Fair. We first met Madelon when she started printing the fair’s event banners on Spoonflower’s Poly Crepe de Chine. and today we’re so pleased to welcome her to the blog (and now the Spoonflower Marketplace!) to learn more about her involvement with RCF and find out how her custom designs went from paper to poly. Whoever said wallpaper was meant just for your walls never met the Spoonflower community. Removable, renter-friendly wallpaper offers the freedom to use your wallpaper in unexpected places like your laptop, desk, bathroom drawers and even your stairs. When it comes to stairs, you come and go on them every day, so why not brighten your way! With the smooth, water-activated option, your project is wallpaper paste free and the woven, peel & stick wallpaper is ready for install once the paper backing has been removed. It’s just that easy! 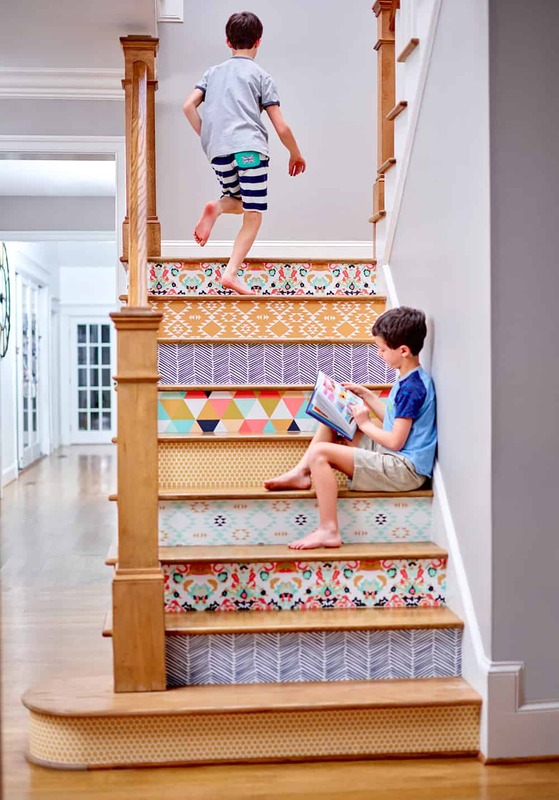 See some of our favorite wallpapered stair projects and find out how you can recreate these looks using designs from the Spoonflower Marketplace. 1. We can’t help but stare at this playful combination of bold colors and geometric prints.